Compiling your employee handbook can be a time-consuming and detailed process. You don't want to miss any essential topics, and you need to make sure the information is presented clearly and effectively — and in a way that will engage your employees. A small business has numerous resources available to help them put together a comprehensive employee handbook. Keep in mind that you don't want your employee handbook to come off as too boilerplate or too filled with technical legal terms — as people may avoid reading it. You want your voice, spirit and intent to come through. You can find many free and relatively low-cost employee handbook templates and “handbook builder" tools online. Some online-based companies charge a few hundred dollars to guide you through the process of creating a detailed employee handbook by asking you questions about your policies and what you want to include in the handbook. They may also provide you a breakdown of workplace policies in your state, so you can easily add those to your handbook. While these programs may greatly streamline the handbook-writing process, some offer more customization than others. If you choose to go this route, you want to make sure you're not creating a handbook that will ultimately feel too generic. Rocket Lawyer. Rocket Lawyer is an online-based legal document template and legal services company tailored for small businesses, which pay a monthly or annual subscription fee. Subscribers have access to a wide range of templates — including an employee handbook tool that walks them through a questionnaire to create a customized handbook. It also provides federal and state-specific policies. Blissbook. Many companies have done away with their paper employee handbooks and moved to digital-only. This can offer advantages, such as making the updating of the handbook easier (no need to redistribute paper copies), as well as helping employees more easily search for the relevant information they need. Blissbook is one company that can build and manage a digital employee handbook for your company. Pricing starts at $750 (for a company with up to 150 employees) and includes e-signature capabilities and data analytics on how many employees have viewed the handbook. Free templates. You can also find many free templates for employee handbooks online by doing a Google search for “free employee handbook template." Just make sure that you only download templates from reputable websites. If you don't feel you have the expertise or time to write and organize your own employee handbook, you can certainly hire an HR consultant to do it for you. Look for a local consultant who stays on top of all the current federal, state, and local employment and labor laws and who has experience in helping other companies create their handbooks. HR consultants may charge by the hour or they may charge a flat project fee. It's a good idea to talk to at least a few before choosing which you'll hire. Hiring a lawyer is by the far the most expensive way to go, but you can rest assured that he or she will be very familiar with the relevant employment laws. Even if you decide to DIY your employee handbook, using customizable templates and tools, you can always consider hiring an HR consultant or employment lawyer to review your employee handbook before you distribute it to employees. This helps ensure that you haven't missed anything important and yet you're not paying to outsource creating the whole employee handbook. If you choose to pay for professional help, don't lose sight of the need to create an employee handbook built around your culture, values, and voice. An outside expert can help you address policies and laws — but they don't know your workplace like you do. Once you've created your employee handbook, the next big challenge is getting your employees to actually read it. It's important that employees understand your workplace rules and policies, so they don't run afoul of them and you won't have to constantly enforce them. Moreover, if you know they've read the employee handbook, then you know they at least are aware of the rules and policies of your small business. 1. Call it something more intriguing than an employee handbook. Big Spaceship, a Brooklyn, New York, mobile app maker, has dubbed its hip employee handbook Our Manual, while financial information site The Motley Fool calls its online handbook The Fool Rules! 2. Focus the handbook on sections employees will care about most. In other words, organize your employee handbook so that the most exciting information — such as your company values and culture and employee benefits — come first. If you start with policies or laws, employees are more likely to stop reading. 3. Deliver the employee handbook in a way they can't miss it. More companies are moving to online handbooks that may live on the company's intranet system or even live on the internet. This offers many benefits: You can add more engaging elements like videos, if you want, and the handbook can be made searchable (so someone can simply type “benefits" and jump to the section they're looking for). Even if you don't want to create a digital handbook, consider how to deliver it at the right time and place. Simply including it in a new employee's welcome package may not work. Consider putting it on their desk on their first day of work and giving them time to read it during the workday. 4. Require employees to read it and show they have. It's a bit old school, and yet you may want to consider requiring employees to sign — either by pen or electronically — once they reach the end of the employee handbook, confirming that they have received and reviewed the information. An employee handbook should be considered a living document — not a one-time project. Employment and labor laws change regularly, and your employee policies may need to change as well — as your business and staffing needs evolve. Review your employee handbook at least once a year and look for ways to make it better and more useful to your employees. If your small business is large enough to have an HR team, have them keep track of common employee questions they receive throughout the year. 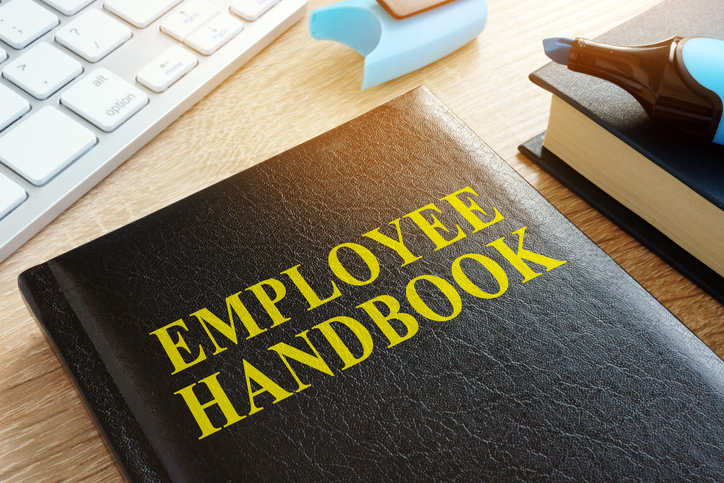 Remember, your employee handbook is a valuable resource that can help save you time, keep your employees informed, and ultimately protect your business in the event of a lawsuit. You should devote enough time to creating and refining it to help ensure you give your employees the most useful guide you can. Creating and managing a comprehensive employee handbook is only one of your many jobs as a small business owner. At times, it may feel as if you have entirely too many responsibilities on your plate — from product design and hiring, to bookkeeping and selling, whether online or in person.